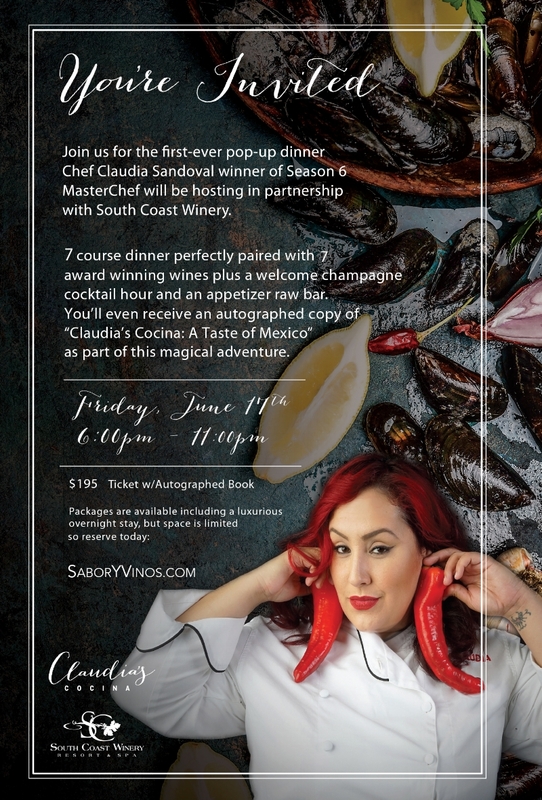 For her first pop-up dinner after winning Season 6 of Masterchef on Fox, Chef Claudia Sandoval teamed up with South Coast Winery Resort & Spa for Sabor Y Vinos: a seven-course wine and food pairing under the stars. The evening began with a three-station raw bar and champagne cocktail hour, followed by dishes from Chef and her team – among them Natasha Clement, winner of Food Network's All-Star Academy, and Chef Iker Castillo, executive chef and owner of Meraki Casa de Humo in Tijuana, Baja California – cooked in an open kitchen outside and paired with wines chosen by South Coast master winemaker Jon McPherson. Guests received a copy of Chef Claudia’s cookbook, Claudia's Cocina: A Taste of Mexico, hot off the presses. We were there to make sure the courses fired on time and everything ran smoothly.